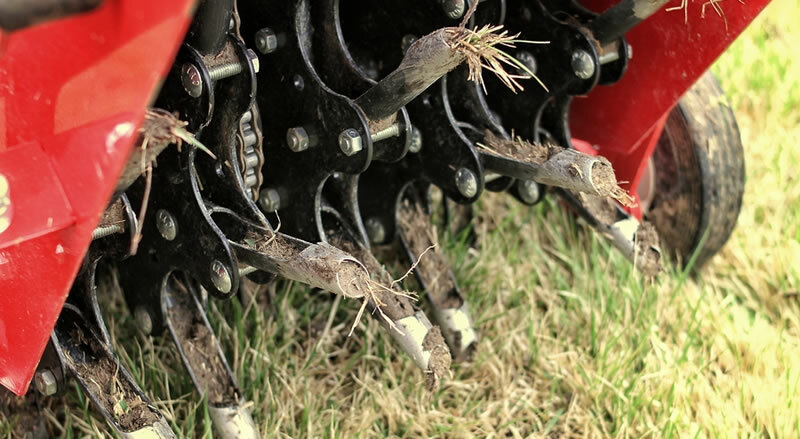 Aerating Your Lawn To Promote A Healthy Root System. We specialize in aerating lawns of all shapes and sizes. Want a healthy looking, lush, green lawn? There are many different steps and processes required to achieve that beautiful lawn you’ve always wanted to have on your home or property. One of these steps which is critical to your lawns success is the aeration of the soil or “lawn aeration”. Aerating your lawn is required because over time grass can grow really thick and when you add in the lawn trimmings from cuttings and the natural lawn thatch (criss crossing of grass near it’s base) you begin to starve the soil and roots below of much needed nutrients, especially Oxygen. Aerating your lawn, helps counter this effect and keeps your soil healthy, in turn your grass can breath and develop healthy roots. Irreco LLC is a full service lawn care and landscape maintenance company based out of St. Louis, Missouri. We specialize in aerating lawns as a stand alone service or as part of a regular annual lawn maintenance program. We work with both residential and commercial clients who have lawns of all shapes and sizes. The lawn aeration process involves using a specialized machine that perforates your soil with hundreds of small holes that allow oxygen, water and nutrients to penetrate directly to the grass roots. The “plugs” that are removed usually contain an inch or two of soil and are about 1/2″ to 3/4″ in diameter. This process delivers oxygen, water and nutrients directly to the roots which encourages the roots to grow deeper and work to maximize the local soil to produce a more vigorous lawn. Aerating has long been a lawn care secret that golf courses and sports fields have employed for a long time because it really makes a difference, especially when it’s used as part of a total lawn care program. Was your lawn just recently installed? These are all signs your lawn could benefit from aerating. The best time to aerate your lawn is during the spring and summer growing season when the roots can recover quickly and the growing grass can work to fill in all of the plugs of grass/soil that were removed during the aeration process. Why Choose Irreco LLC To Aerate Your Lawn? We understand that you have many landscaping contractors to choose from throughout St. Louis. We just want you to know that when you choose to work with Irreco you are partnering with a small, locally owned business that has more than 15 years experience caring for lawns in Missouri.